Crossing through Arvada, northwest of Denver, heading to the mountains. The higher mountains are obscured by the clouds. The train must pass through over 40 tunnels in the Rockies, including the 6 mile long Moffatt Tunnel under the Continental Divide. 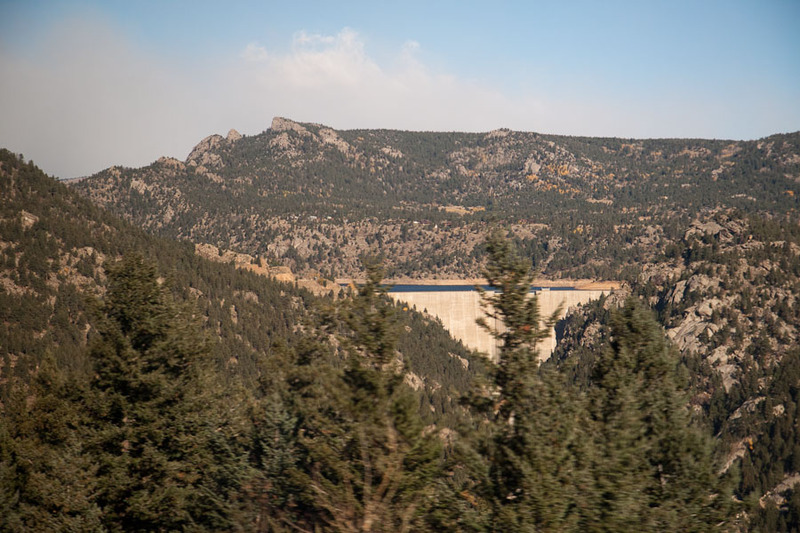 Gross Dam, with Gross Reservoir behind it. Gross Reservoir, one of the main water supplies for Denver. Continuing up through the mountains near Pinecliffe. Tolland and the old school house. It's lightly snowing here. 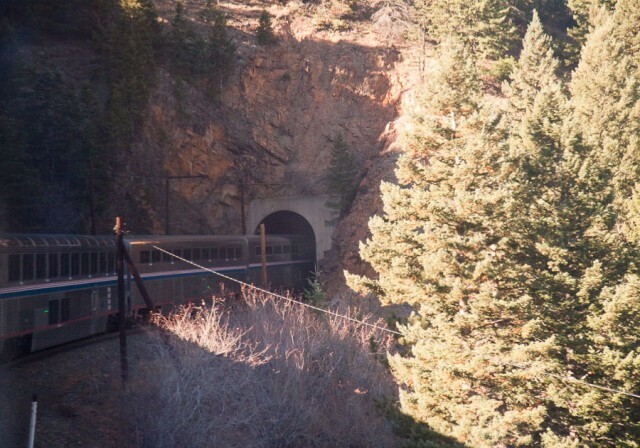 The tunnel under the Continental Divide is approaching. There are no photos of inside the tunnel because it's pitch black. We have emerged out of the tunnel on other side of the Divide near Fraser. I have moved from my room to the Observation car. 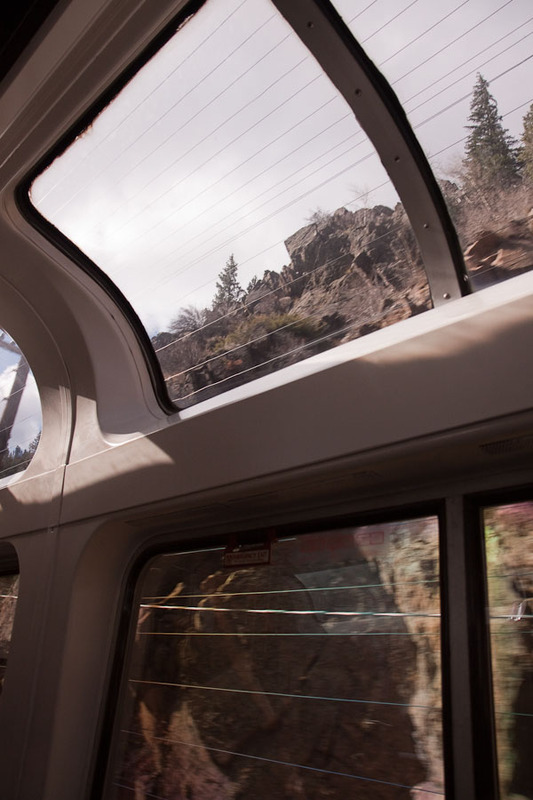 The windows up top are handy for viewing the steep canyon walls along the Colorado River. We are near Hot Sulfur Springs, Colorado. 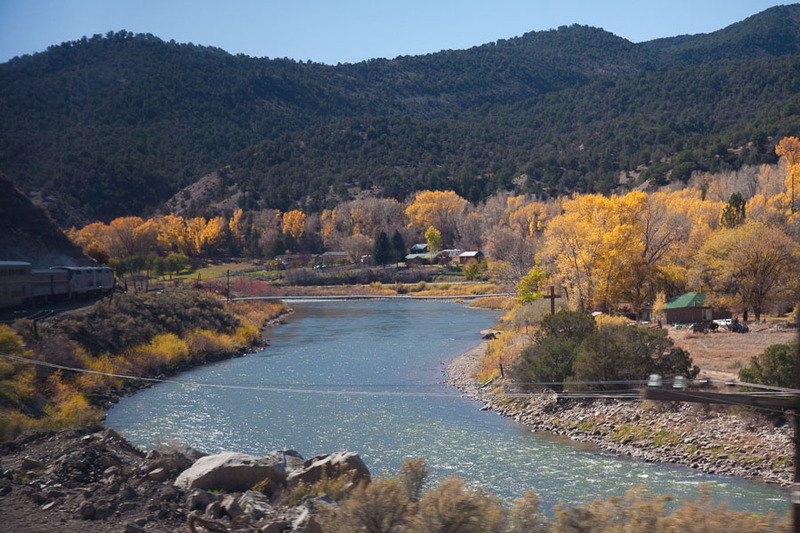 Slowly descending in elevation, we pass golden fields along the river. The steep canyon walls of Gore Canyon. No roads pass through here. 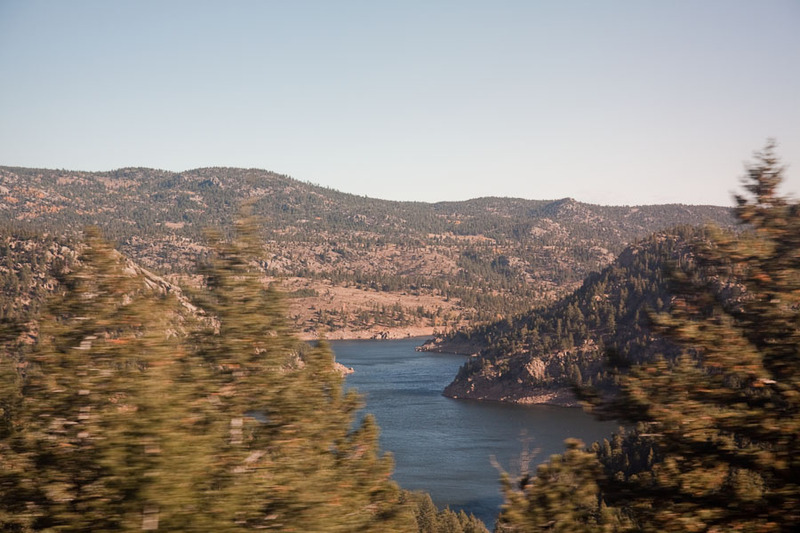 Many places like this can only be viewed from the train. In this photo, I accentuated the reflections in the window using a polarizing filter. Getting closer to Glenwood Canyon and Glenwood Springs, Colorado. 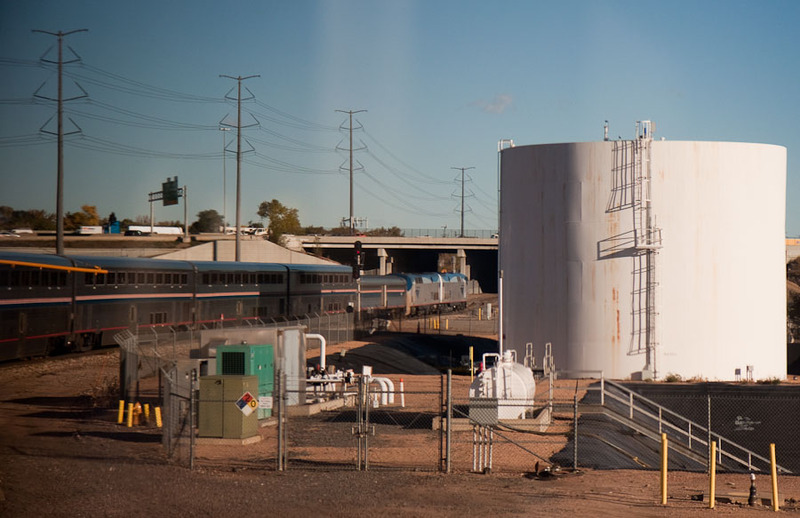 Train stop at Grand Junction, Colorado. A good time to stretch and walk around a little. 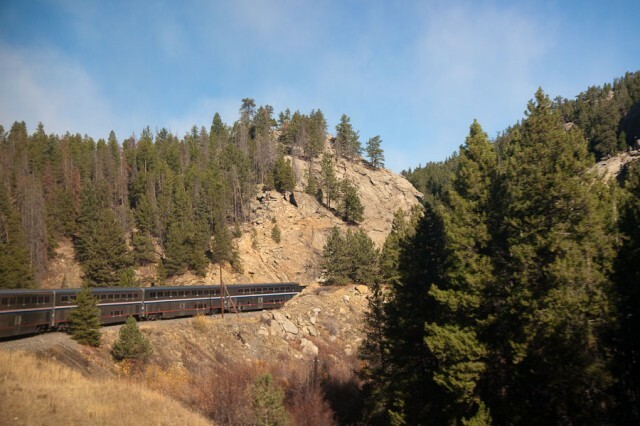 From front to rear, the train consisted of two locomotives, baggage car, a crew dorm, three coach cars, observation/lounge car, dining car, and two sleeper cars. 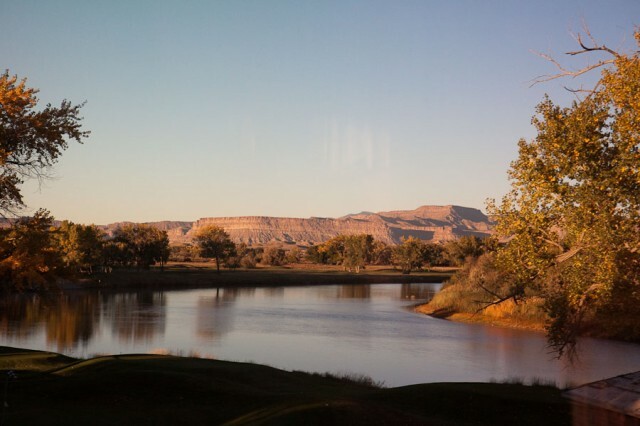 Following the Colorado River and getting closer to Utah. It is also getting late in the day. Again, this area is only viewable from a train. Time for dinner in the dining car as the sun sets on the bluffs on the way to Price, Utah. A quiet stop in Salt Lake City. Most of the other passengers had gone to bed. My sleeping compartment was in the last car on the train. 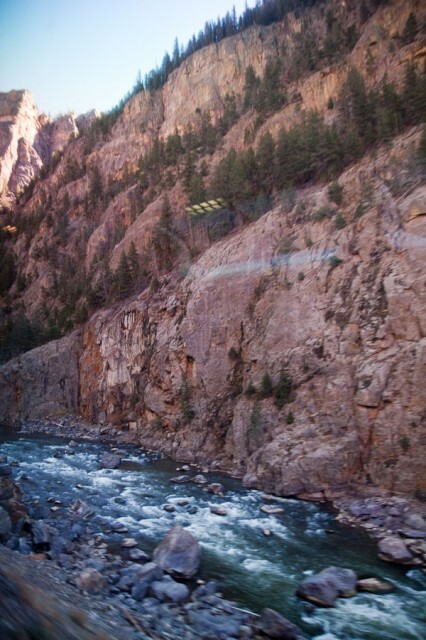 View through the hallway window of my sleeping compartment (Roomette). It is still in daytime mode with the seats up. 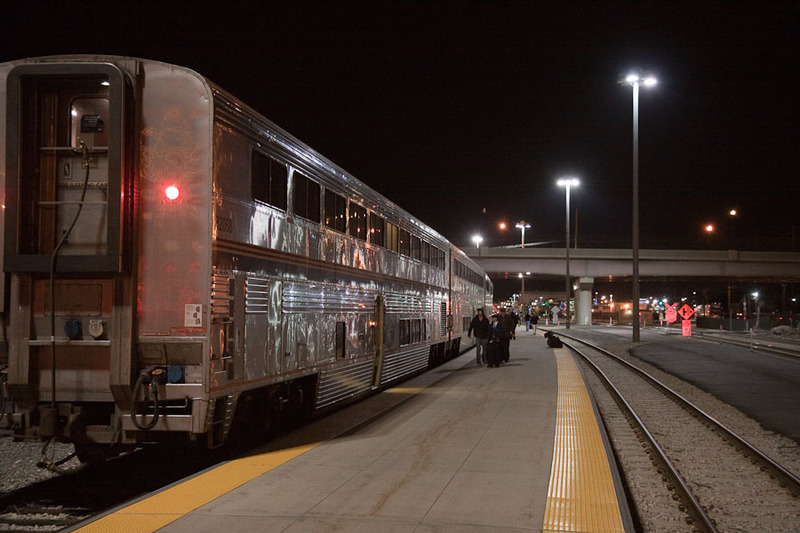 A graphic showing what the Roomette looks like in night mode without the front wall and door leading into it. 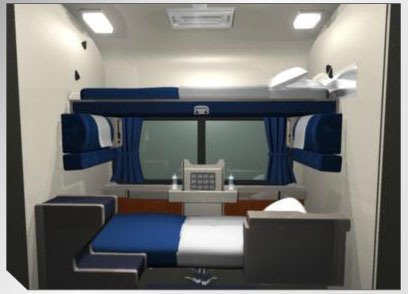 It can sleep two adults, but it would be a bit cramped because the top bunk is pretty small. The lower bunk was perfect for me and allowed me to watch the stars while traveling 80 MPH across Nevada. There are curtains on the windows into the hallway to give one privacy. To learn more about sleeping accommodations, take Amtrak’s 3-D tour, here. There’s even a shower downstairs. 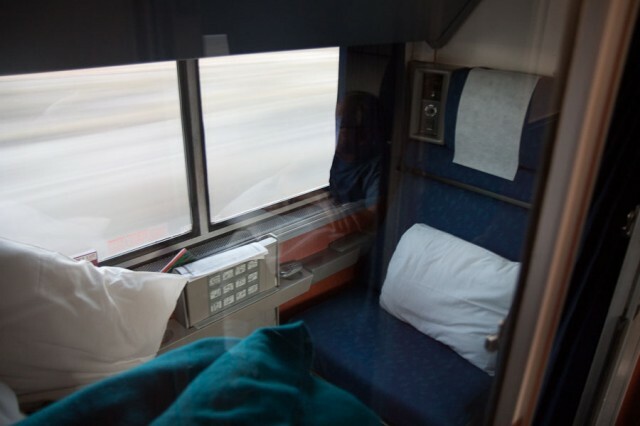 This was my first time sleeping in a bed on a train. It was surreal. The primary thing that kept me from sleeping better was my own excitement. I’d doze off and then wake-up and want to sit up and look out the window, wondering where we were. The sounds were interesting. There was a whining in the rails that would change pitch. The car would sway up, down, back and forth, but not annoyingly so. It would actually rock me to sleep. I’d always wake-up when we stopped to let a freight train pass in the opposite direction because everything would suddenly get quiet. 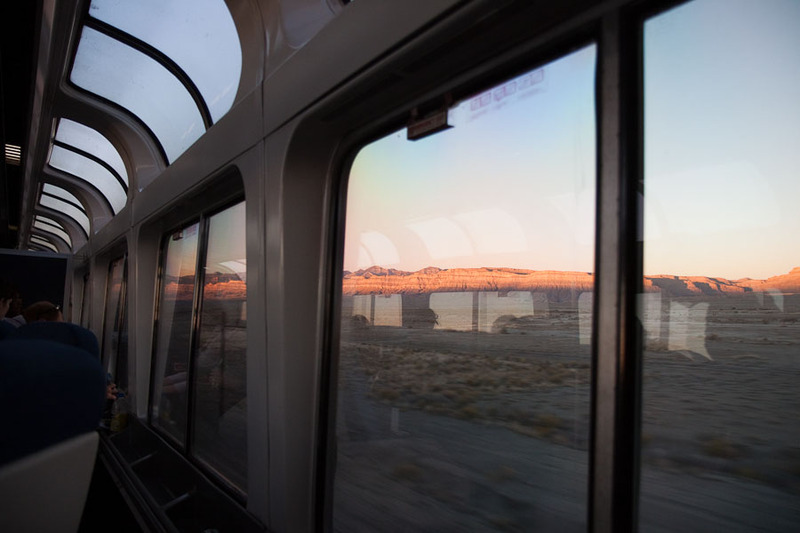 I was up, like a boy on Christmas morning, as soon as the sky lightened, watching the sage brush in the rising sun as we headed towards Reno, Nevada. Being the geek and rail fan that I am, I brought along my GPS which would tell me where we were and how fast we were going, and my scanner radio so I could listen to radio communications with the train. How exciting. I’m sure I’ve told you I’ve wanted to travel by train, although, I don’t think it’d be as beatnik as I imagine. It is silly you had to go all the way down below to catch your train. Pine Cliff or the East Portal would’ve been closer. Of course, there’d have to be the ways and means for a passenger to board there. I suppose sleeping in a coach seat is beatnik. Most of the other travelers do that because it is very inexpensive. But I also heard stories of restless people who couldn’t sit still and were constantly getting up and moving around keeping the other folks awake. Nice thing about my room is that I could close the door and shut-out the other passengers. Yes, I would have loved to have been able to flag down the train in Rollinsville. 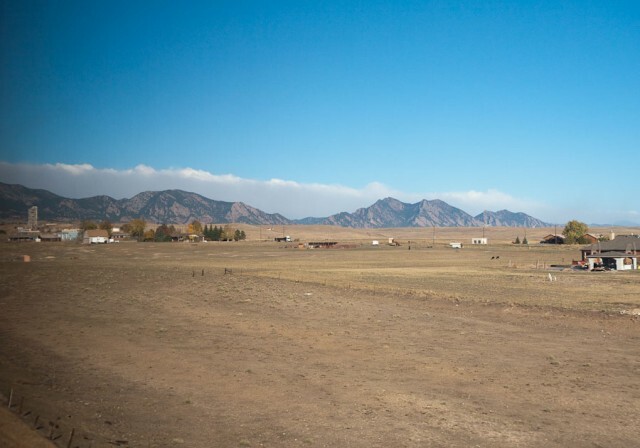 It would have saved some major headaches and stress I had getting to the Denver station. I love travelling by rail though have never slept on a train. Sounds like a really great journey…we were also in San Diego, but our stop in San Francisco was cancelled….one of these days. It was probably the most relaxing mode of travel I’ve done. I hope you had good weather. I heard there were some days of gray and drizzle before I arrived. Be sure to find a copy of Henry Kisor’s book: “Zephyr: Tracking a Dream Across America”. I have the hard-cover and also have it in e-book form – and have read it at least 3 times – and got to ride the Zephyr once. Thanks, I’ll check into it. I live just a few miles from where the Zephyr’s tracks pass through the Rockies, so I see the train often. Thanks for the suggestion! 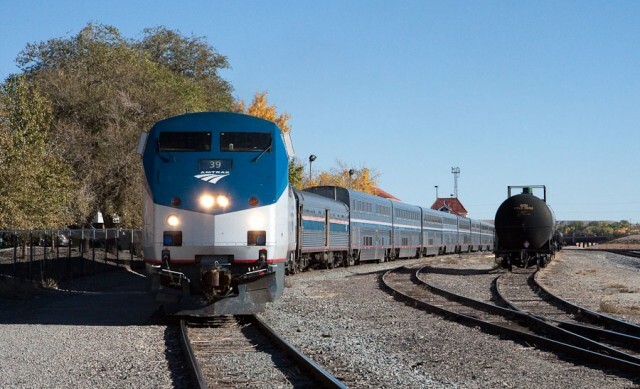 I read before going to bed, and now I can close my eyes and remember riding the Zephyr last summer, being evacuated from said train after the Nebraska derailment, and coming back home on the Empire Builder. I drive my wife nuts with being a train fiend. I love Amtrak! Thank you for those awesome photos. My Dad was conductor on Amtrak when Southern Pacific I believe owned them? He retired in 1986, but I sure wish I had followed his foot steps. I would love to work Amtrak! Such a beautiful way to travel. Amtrak was formed from 20 different railroads (see here: http://en.wikipedia.org/wiki/List_of_railroads_eligible_to_participate_in_the_formation_of_Amtrak) and Southern Pacific was one of them. The employees I talked to about their jobs, seemed to like them. I don’t know if I could do it for a career, but it would be fun to take a summer off and work for Amtrak. Thank you, I didn’t know that. I remember the days when Amtrak had the right of way. Thanks for the information! What a great idea, bringing a GPS and scanner radio! We’ve a TomTom, I wonder if that would work on a train. What a vicarious thrill to experience your photos and narrative. It feels like each train is its own major character, influencing everything from your vantage to, of course, the landscape you pass through. I love the image of you waking up like a kid on Christmas, with such anticipation to see where you are. The fast speed trains in Germany that I have a bit of familiarity with are a whole different animal compared with these characters you describe. I’m intrigued! Thanks for sharing your adventure. At some point in the future, I will do this train loop again. I wonder how it will differ since it won’t be my first time? 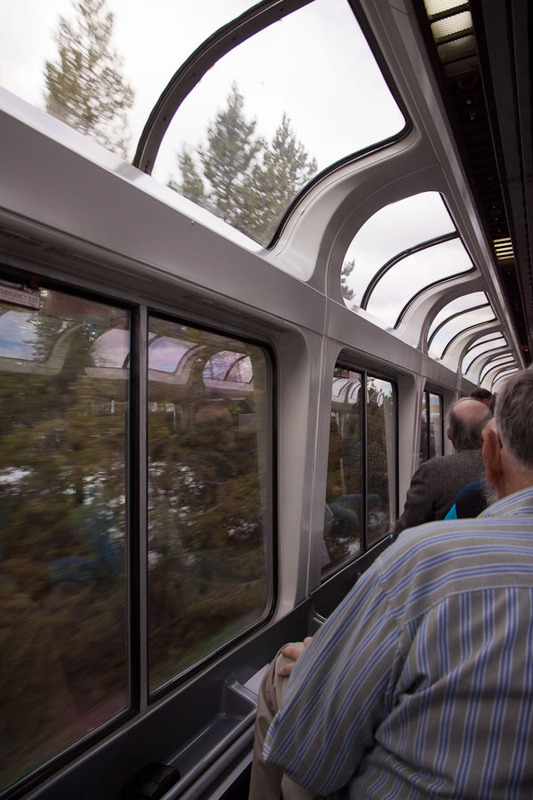 And speaking of vicariousness, it was fun to be in the observation car with other passengers who’ve never traveled through Colorado previously and to see/hear their expressions. 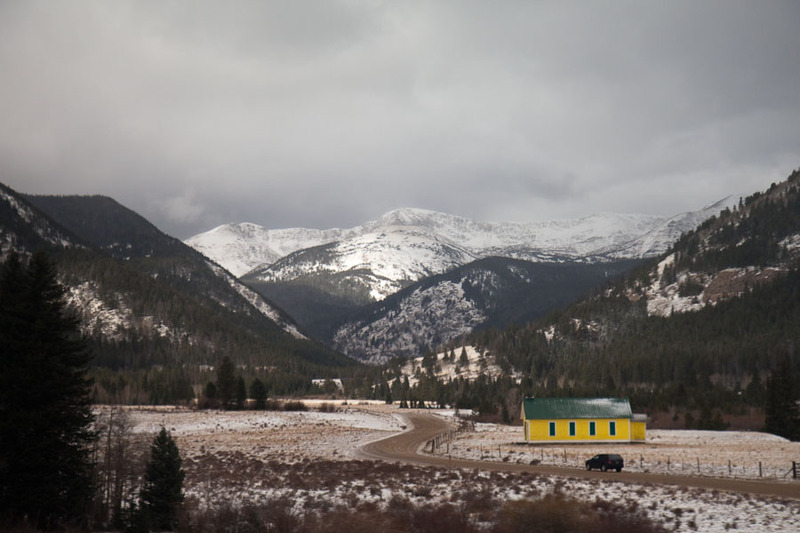 I got to see Colorado through fresh pairs of eyes. Lovely and evocative photos! 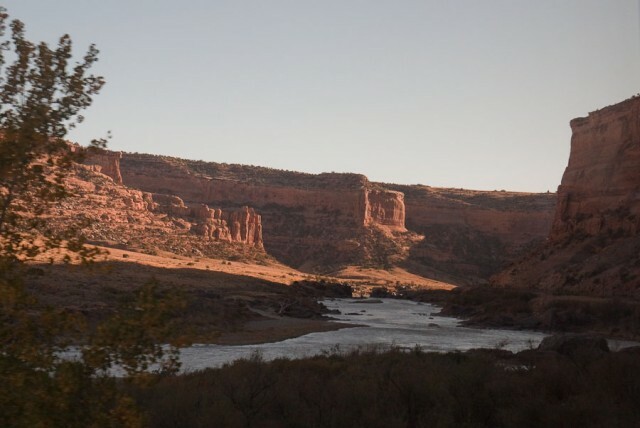 My favorite is the Green River shot … and that’s one of my favorite parts of the journey, too. 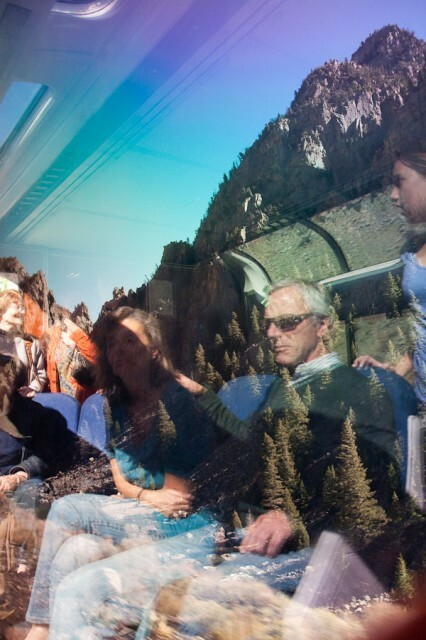 The inspiration for the trip was definitely sparked by your Amtrak travels and the time we met in Denver and you showed me your sleeping car.